I have an 86 year old, drinking, smoking, tattooed Grandmother with the nickname Boboji. And this is her story. 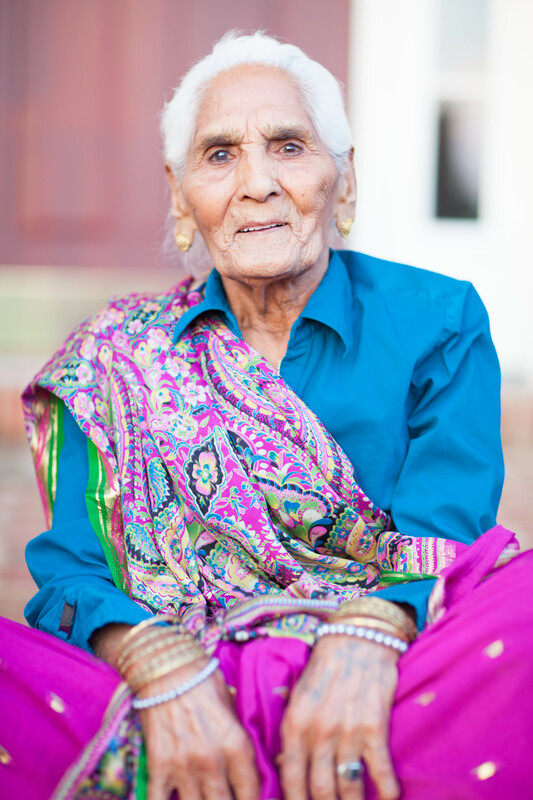 Boboji, my maternal grandmother was born in a small village in northern India in 1926; the eldest of three children. Although her given name is Raghuviri, she is known by everyone as Boboji. During the British Occupation of India, at the age of 14, Boboji was married to my 13 year old grandfather though she didn’t officially move in with him and his family until the age of 17, and even then on a part-time basis as she had to often return to her family village to care for her very ill mother and younger siblings. Though the villages were only 30 kilometers apart it was a long journey traveled by horse and carriage and it was a significant amount of responsibility carried on the slim shoulders of a 17 year old girl. A few years later, at the age of 20 Boboji lost her mother, but gave birth to her first child, a daughter who later became my mother. After the loss of her mother, and with a young daughter to care for, Boboji continued the journeys to her family’s village to help care for her younger brother and sister. Five years later, Boboji gave birth to what I’m told is the most beautiful baby boy. This boy named Surinder was the light of her life, but tragedy struck when before his second birthday he died of dehydration. Two years later she gave birth to another boy and believing that her baby boy had been reincarnated in this new child she named him also Surinder. Believe it or not this story repeated itself with a pair of baby girls. Boboji’s fourth child was a beautiful baby girl named Sudesh, but by 18 months old she passed away. Thereafter another baby girl came along, who was also named Sudesh. By the age of 34, Boboji had been married 20 years, lost her mother, gave birth to five children and buried two of them. You know that moment of your life when a split second decision changes things? When you wonder, what if? Boboji had that moment at the age of 39. The men of the household had all left the village and gone to town leaving the women and my grandfathers younger brother home. Bandits learned about the travels and decided to seize the opportunity to raid and pillage the home. Not only did they rob the home, but they began beating my great-uncle with steel sticks to the point that he lay on the ground helpless. This is the moment my Boboji showed her strength and became a hero. She threw herself on my great-uncle to protect him and took the brunt of the beatings. Fortunately, my uncle made a full recovery; unfortunately Boboji did not. Her back was broken and my grandmother who used to stand 5’7″ tall could no longer stand straight. She now walks completely hunched over at a 45 degree angle and has had to manage the pain with various home remedies including smoking hookah and shots of whiskey. That one moment of heroics stays with us a constant reminder of the strength of a woman. A woman who saved a life, who saved a home. Today Boboji splits her time between India and the United States, except now instead of traveling via horse and carriage, she flies. She has her 3 children (though she still talks of the two beautiful children she lost), 11 grand-children and 12 great-grand-children. Whenever I see her she blesses me by wishing me a long life for my husband, and wishing that I someday have a son. I smile and thank her, knowing that she doesn’t fully realize a woman’s worth. In fact, she hasn’t fully realized her worth. This entry was posted in Family and tagged family, grandmother, India, indian village by shwetasays. Bookmark the permalink. amazing story of a great woman, and that photo is beautiful. I think Boboji’s strength has been passed down to her granddaughter. Just think, someday baby J’s daughter may tell her own compelling story about you. Loving your blog! Beautifully written story of a beautiful woman. Thank you. beautiful story…makes me miss my granny. What a beautiful story about an equally beautiful person. Its heartening to see someone in our generation telling such a compelling tale with just the right words. Thank you for sharing. I reached to your blog via Nidhi Chenani’s. Glad I did! Would look forward to more stories! All the best. Thank you so much Bhavna! So kind of you to say. One day I plan to write the story of my other grand-mother. Her life was also very interesting.